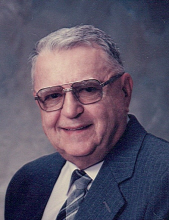 Robert E. Wills, 95, of Beecher City, Illinois passed away at 5:45 p.m. on Thursday, March 21, 2019 at Aperion Care in St. Elmo, Illinois. Robert was born October 29, 1923, in Loudon Township, the son of Lantz and Mabel (Engler) Wills. He was a 1941 graduate of Beecher City High School and was a veteran of the United States Air Force having proudly served his Country from 1943-1947. Robert and Vera Wright were united in marriage on June 12, 1943 in Grenada, MS and she preceded him in death on October 10, 2012. Robert farmed in the Beecher City area for many, many years. He previously served on the Beecher City school board and the Loudon Township board. When not out working the fields, he enjoyed drawing cartoons and making wooden yard signs. Surviving are his son, Mike (Leila) Wills of Beecher City; daughter, Donna Laue of Millbrook, AL; five grandchildren; 12 great-grandchildren and four great-great-grandchildren. He was preceded in death by his parents, wife and son-in-law Jim Laue. Graveside services will be held at 10:30 a.m. on Tuesday, March 26, 2019 at Beecher City Cemetery with Pastor Don Miller officiating. Memorials may be made in his name to Meals on Wheels, c/o Betty Ann Clark, 100 Park Rd, Beecher City, IL 62414. Lockart-Green Funeral Home in Beecher City is assisting the family. Family and friends are invited to light a candle or share a story in Robert’s honor at www.lockartgreenfuneralhome.com. To send flowers or a remembrance gift to the family of Robert E. Wills, please visit our Tribute Store. "Email Address" would like to share the life celebration of Robert E. Wills. Click on the "link" to go to share a favorite memory or leave a condolence message for the family.